Alliance Française's Africa Belle Soirée Tonight! 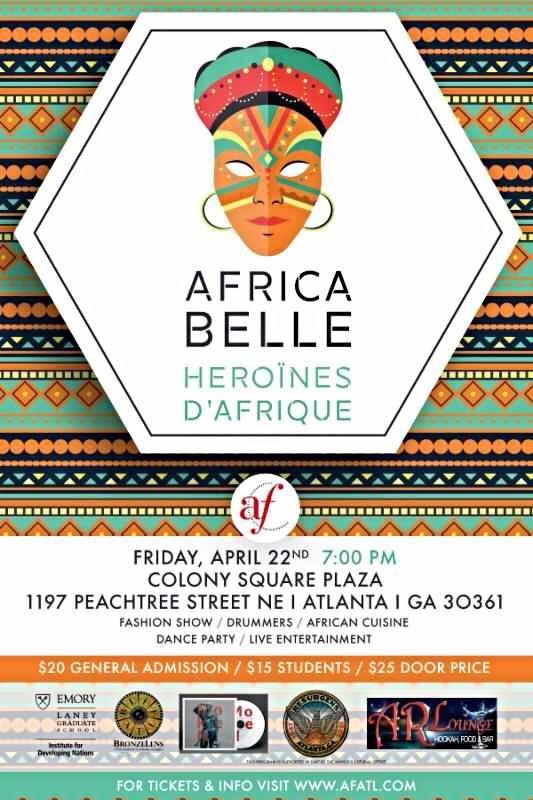 Tonight May 22, 2016, Alliance Française hosts their annual Africa Belle Soirée at Colony Square in Atlanta. The 6th Annual Africa Belle event will be the finale event to a week long celebration where the francophone, francophile and general admirers of the African diaspora have attended dialogues, women's entrepreneurial activities and more. This year's theme Héroïnes d'Afriques (Female African Heroes) focuses on strong women in the diaspora who have amazing stories to share and extremely influential to their generation in both business and day-to-day affaires. The soirée this year will allow local contemporary African vendors to sell at the event, have great western/central-African dishes served to its guests, music, dancing and end with a highly anticipated runway show. This event is a must-see and will be held at the Alliance Française d'Atlanta's office located at Colony Square in Atlanta, Georgia. For more information about Africa Belle, please visit www.afatl.com.